1. a natural earthly material that is plastic when wet, consisting essentially of hydrated silicates of aluminum: used for making bricks, pottery, etc. The body being defined as clay? In the simplest definition, the human body is made up of a handful of elements, mostly consisting of water. Humans and clay are essentially made of the same basic elements. Unlike the human body, water is added to clay to form what is desired by the potter’s hands. Without the work of the potter, the clay would remain with the earth. The body, being defined as that of clay, could also be seen in this simple context, from the earth, to the earth. Let there be no mistake, the human body is more complex than a jar of clay, but like clay, it can be shaped to hold the greatest treasures and has the potential to become a beautiful piece of art. It isn’t uncommon to see people turning their bodies into their own versions of art. Tattoos are less the taboo that they once were. Adorning the body with pieces of art through tattooing takes time and can be painful. To the person desiring the tattoo, the expression of the work is usually well worth the pain of getting it. It has also been widely acceptable in America to have piercings. The brief moment of pain and subsequent care after the piercing is worth the look achieved. In both examples, the outcome of the initial pain was known and a decision was made to endure pain and/or the care involved. Such a process would be less desirable if the outcome was unknown and the only information given was a promise of beauty. That would take a great deal of trust and not being assured of the end result could cause anxiety and less of a tolerance of pain. Ask anyone who paid for a tattoo that ended up looking more like the doodling of a two year-old or the small percentage that got an infection from a piecing. Instead of beauty, they received a problem. Decisions such as these would be simpler to make if there was foreknowledge of the result. Since there is no way to know how the experience will end, asking questions can help make the best decision. If clay could ask questions or talk, what would it say to the potter? It certainty would want to know what the potter intended for it, but what else? Fortunately for history, clay made no such demands or statements. Human ancestors molded and fired the clay to serve a purpose and clay is still serving a purpose today. Finding a purpose for the human existence is vastly different than that of clay but it can help define a purpose. Both start out as a shape unrecognizable to the finished result. Humans at some point in the womb resemble a tadpole more than a human but with time, develop all the necessary components. Witnessing a heartbeat via ultrasound when the baby is no more than a few weeks gestation is no less than astonishing. A heart that will beat thousands upon thousands of times in a lifetime begins so miniscule inside a mother’s womb. In the womb is where the molding process begins. First with the physical form and then as the child grows, the internal. Parents nurture and protect children and try to shape them into responsible and respectable adults. Parents nurture the aspects of a child’s life to help him or her understand the world and prepare for the fire that will eventually come. And this shaping by fire never ends. Into adulthood the experiences shape existence, while still relying on the early work of the parents. All with the hope the now adult can navigate the world alone. Unlike the clay, humans can ask questions on what they will become. “Why has this tragedy happened to me? Also unlike the clay, life is shaped over a long period of time and the fire doesn’t come all at once. Sometimes the fire is hot enough to harden only the outside and protect what is within and other times, the heat is so intense that it hardens on the inside and out. The true works of art are those formed with the most intense heat, whose flames are not meant for every piece of clay. Those special pieces are chosen carefully and will have lasting strength and beauty. Because the end result of these rare pieces is beauty beyond compare, it takes time and trust in the process. These rare works of art can hold the most valuable possessions and stand the test of time. No, money cannot buy an average piece the result meant for the rare and it’s not worth the value gained by experience. 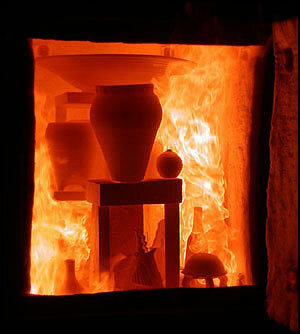 A plain pot can be painted, decorated and made to resemble what intense fire has fused but it cannot have equal strength. Are you the rare pot? Have you been asked to carry the heavy burdens? Because the heat is so intense, the process for the rare pot is painful and there is no knowledge of why and how the fire will result in beauty. Often times questions have to remain unanswered and trust wears thin but like the rare pot, the experience in the hottest fire yields invaluable experience. Each time the rare pot is exposed to the next round of heat, the harder it gets and the value of the treasures entrusted grows. What gem has been entrusted to you? Maybe it is the most delicate that must be placed in the strongest of places. If you are asked to endure the intense flames, your beauty will only shine more brightly every time you endure. Unlike the common, this beauty isn’t by choice and can only be seen at the surface but has been shaped and formed changing the very elements of your life. Don’t get discouraged you rare and beautiful piece, welcome the fire, for each flame brings you closer to unmatched beauty. Next > FURIOUSLY HAPPY. And scared. And back to happy again.